Dog owners are being urged to double check their dogs aren’t overweight on the back of new research showing that carrying extra weight can shorten a canine’s life. Dr Louisa Fenny, a veterinarian with national mobile vet service Pawssum Vets, said obesity in dogs was a major issue. “We’re very passionate about helping people ensure their pooch isn’t overweight because it can cause unnecessary health complications which can mean people get less time with their beloved pet,” said Dr Fenny. 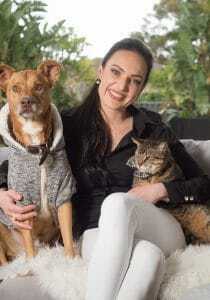 “It’s actually a very delicate issue – many owners will become defensive or search for excuses while others will simply laugh it off which, while not unusual, is worrying; we want owners to take it seriously because it impacts their pets’ health and happiness,” she said. “Sometimes people whose dogs are the correct weight for their breed and size have been told and believe their pet is underweight or underfed which shows it’s common for owners to have a skewed opinion of what is normal. “To be the correct weight, you should be able to feel your pet’s spine and rib cage and they should have a well defined, tucked-in waist line, no matter of how ‘large boned’ or muscular they are. Results from this latest study of more than 50,000 dogs across 12 popular breeds, conducted retrospectively across two decades, were published in the Journal of Veterinary Internal Medicine. Dr Jon Berkowitz, Pawssum CEO, said that all Pawssum vets conducting a clinical examination would advise owners if there was a weight issue. If needed, they can work out the correct feeding of current diets or the best diet to change to. Pawssum vets are able to do this in the comfort or your own home or office where they can see the diet and treats being fed. If you’d like to have your pet assessed or a diet review done please book via the home page or call us on 1300 34 35 80.